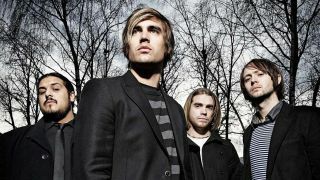 Fightstar will release their first studio album in six years on October 2. Behind The Devil’s Back is the follow-up to 2009’s Be Human – and they’ll back the launch with nine UK dates the same month. Frontman Charlie Simpson tells Kerrang: “This album is fresh and modern but still uniquely identifiable as Fightstar. The band went on hiatus in 2010 and returned last year with two 10th-anniversary shows in London. They issued an acoustic take of debut album track Open Your Eyes in November and played at last month’s Download. Behind The Devil’s Back is available to pre-order direct from Fightstar’s website. Tour tickets go on sale at 10am tomorrow (July 24).